Febreze with Odourclear technology cleans away odours and leaves a light fresh scent. Cleans away the toughest odours leaving a light scent of fresh clean. Doesn't mask but truly cleans away tough lingering odours, leaving a light fresh scent. Amazing light fresh fragrances. Non-flammable, 100% natural propellant. Wide range of high quality fragrances. Febreze Air Freshener with Odourclear technology cleans away tough lingering odours, leaving a light fresh scent. Cleans away the toughest odours leaving a light scent of fresh clean. While some other air fresheners only mask odours with fragrance, Febreze truly cleans away odours, so you and your guests can breathe happy. Febreze Aerosols are non-flammable and contain 100% natural propellant. Febreze Air is like a breath of fresh air sweeping away even tough lingering odours and leaving a light fresh scent, making your home feel fresh and renewed every day. 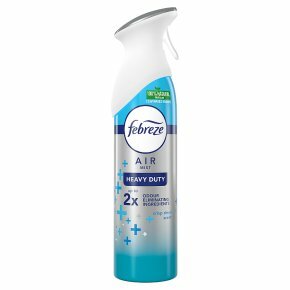 Try the full range of Febreze products with the unique Odourclear technology, such as Febreze Fabric Refresher and Car Freshener. Also try Febreze 3volution Plugs, for continuous odour elimination up to 90 days. Pressurised container: May burst if heated. Keep out of reach of children. Avoid contact with skin and eyes. IF in EYES: Rinse cautiously with water for several minutes. Remove contact lenses, if present and easy to do. Continue rinsing. CAUTION: Use only as directed. Keep away from heat, hot surfaces, sparks, open flames and other ignition sources. No smoking. Do not pierce or burn, even after use. Protect from sunlight. Do not expose to temperatures exceeding 50°C. 5% by mass of the contents are flammable. Contains Benzisothiazolinone. May produce an allergic reaction.